This letter was written by Darius Johnson (1828-1877), the son of Cyrus Johnson (1785-1853) and Margaret Armstrong (1786-1881) of Conquest, Cayuga County, New York. Darius came to Pontiac, Livingston County, Illinois in 1852 and soon had a large practice. He was married to Rebecca Wood (1833-1922) in July 1854. Their boys — referred to in this letter — were Leander Johnson (1859-19xx) and Fordyce Benjamin Johnson (1860-1926). At the time of his death in 1877, Darius was county coroner. He served as a trustee of the University of Illinois at Champaign. 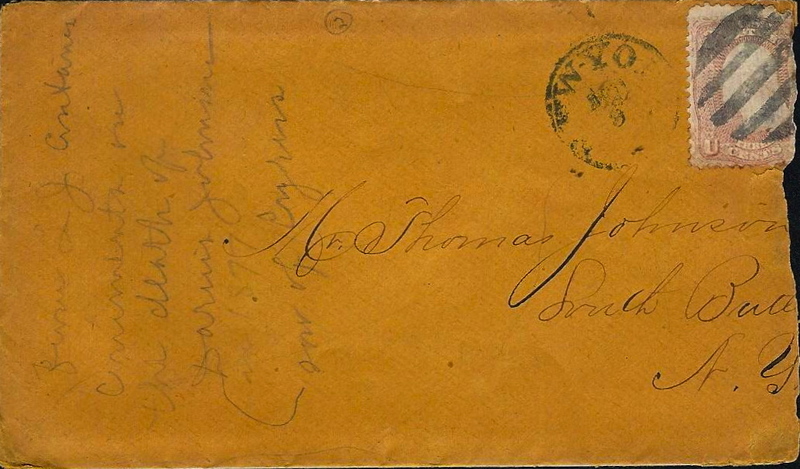 Darius addressed the letter to his brother, Thomas Johnson (1814-1890), who was married to Anceanda Bassett Craw (1818-1892) in March 1840, but the letter seems to have been written to his nephew, Morris Johnson (1841-1912). Morris, at age 22, and Laurence Johnson (1845-1893), at age 18, both enlisted on 29 December 1863 in Co. A, 9th New York Heavy Artillery. It has been a long time since I received your letter speaking of the death of your sister Mary. I can say I deeply sympathize with you in your sad bereavement but trusting your loss is her gain you must try and be reconciled. My family are well & we think we have got two of the smartest boys in the nation. Leander can talk as plain [as] I can. Says his name is young Doct. Johnson. You can tell my mother that my money matters are quite easy. We have a good house and plenty to eat & some money to spend and some drawing interest also. I have a good practice and besides, I won $115 from the Democrats this fall. I called it taking Democratic Blood. I don’t believe in betting but the devils kept tormenting me [such] that I had to resort to that course to protect myself. And when they found out that I would bet, they let me alone. I tell you I use to bluff them. After I got to betting, I would bet every cent I had in the world if they had come to time, but they got weak in the knees when you showed them the money and told them to come down. I used to tell them I had plenty of money, horses, land, town lots, county orders, or anything they wanted to put up. Then they would have a pious streak and say they did not believe in betting. Pious set those Democrats are. But no more today.